Don't you love that pan? It's this. 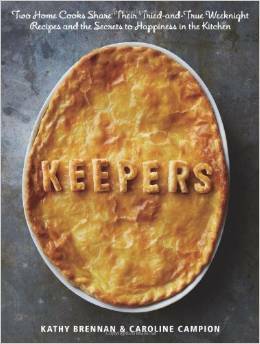 Keepers is another book that's being passed around to the members of Cook My Book, and when I saw this recipe for skillet lasagna, I was intrigued. I love lasagna, but it's usually a pretty big production. And when I make it, I make a lot. This recipe seemed like a more reasonable size, and it cooked on the stovetop, which made it much more summer-friendly than cranking up the oven for a long bake. And it cooked relatively quickly, too. With all the prep and the resting time after - and time to take a couple photos - this was done in about an hour, with enough free time in the middle of cooking to make a side dish and salad dressing. The original recipe in the book was twice this amount, but I cut in in half since there are only two of us, and we're not as hearty eaters as we used to be. With some vegetables as a side dish, we only managed to eat about 1/4 of this for dinner. I'd imagine that for heartier eaters, this would feed three or four people. This was pretty magical. It started out pretty soupy, but by the time it was done, it really was lasagna-like, with a thick sauce and layers of pasta. The only thing it was missing was the browning of the cheese that you'd get from an oven-baked lasagna. But, if you really miss that browning, all you need to do is put the pan under the broiler for 30 seconds or so. In a 2-quart or larger saute pan with a lid, heat the olive oil on high heat until it shimmers. Add the sausage, and cook, stirring to break the meat into small chunks. until the meat is cooked through and browned. Turn the heat to low. Using slotted spoon, transfer the meat to a small bowl. Leave as much of the oil in the pan as possible. Add the onions, garlic, and pepper flakes ad cook, stirring as needed, until the onion are softened - but watch carefully so the onions and garlic don't burn. Add the oregano and tomatoes along with all the juice), crushing the tomatoes with your hands as you add them. Or, you can break up the tomatoes with a spoon or masher after you add them. Add the meat and any juices that collected in the bowl. along with the oregano. Add salt and pepper to taste. Cook gently for about 5 minutes, then taste for seasonings. It should be slightly salty - the noodles will need the seasoning. Discard the basil sprig. Break the noodles in half crosswise. If smaller pieces break off, that's fine. Push half of the noodles down under the sausage and vegetables, distributing them through the pan as evenly as possible. Place the rest of the noodles in the pan, pressing them down so they're under the sauce. Cover the pan and cook at a gentle simmer until the noodles are tender, about 12 minutes. he sauce should be slightly thickened. Put the cream cheese, in small spoon fulls, on top of the lasagna, then swirl it into the sauce as it melts. Place the mozzarella on top of the lasagna, then cover the pan again and cook until the cheese is melted, another 2 minutes. Take the pan off the heat, remove the lid, and place the basil leaves on top of the lasagna. Let the lasagna rest, ucovered, for about 10 minutes before serving. What Kind of Cauliflower are YOU?